Being the first Frenchman to circumnavigate the world, during the 18th century. Louis-Antoine, Comte de Bougainville (French: [buɡɛ̃vil]; 12 November 1729 – 31 August 1811) was a French admiral and explorer. A contemporary of the British explorer James Cook, he took part in the Seven Years' War in North America and the American Revolutionary War against Britain. 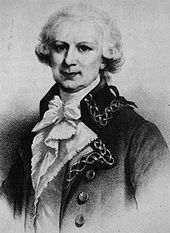 Bougainville later gained fame for his expeditions, including circumnavigation of the globe in a scientific expedition in 1763, the first recorded settlement on the Falkland Islands, and voyages into the Pacific Ocean. Bougainville Island of Papua New Guinea as well as the Bougainvillea flower were named after him. Bougainville was born in Paris, the son of a notary, on either 11 or 12 November 1729. In early life, he studied law, but soon abandoned the profession. In 1753 he entered the army in the corps of musketeers. At the age of twenty-five he published a treatise on integral calculus, as a supplement to De l'Hôpital's treatise, Des infiniment petits. In 1755 he was sent to London as secretary to the French embassy, where he was made a member of the Royal Society. Young portrait of Louis Antoine de Bougainville. In 1756 Bougainville was stationed in Canada as captain of dragoons and aide-de-camp to the Marquis de Montcalm. He took an active part in the capture of Fort Oswego in 1756 and the 1757 Battle of Fort William Henry. He was wounded in 1758 at the successful defence of Fort Carillon. He sailed back to France the following winter, under orders from the marquis to obtain additional military resources for the colony. During this crossing, he continued to learn about the ways of the sea, skills that would later serve him well. Having distinguished himself in the war against Britain, Bougainville was rewarded with the Cross of St Louis and promoted to colonel. When he returned to Canada the following year, he had gained few supplies. The metropolitan officials had decided that, "When the house is on fire, one does not worry about the stables". During the pivotal year of 1759 (see Seven Years' War and French and Indian War), Bougainville participated in the defence of fortified Quebec City, the capital of New France. With a small elite troop under his command, among which were the Grenadiers and the Volontaires à cheval, he patrolled the north shore of the St. Lawrence River, upstream from the city; he prevented the British several times from landing and cutting communications with Montreal. He did not have sufficient time, however, to rally his troops and attack the British rear when they successfully ascended the Plains of Abraham and attacked Quebec on 13 September. Following the death of the Marquis de Montcalm and the fall of Québec on 18 September – after the colonel's aborted attempt to resupply the besieged city – Bougainville was dispatched to the western front by his new commanding officer, the Chevalier de Lévis. He attempted to stop the British advance from his entrenchments at Île-aux-Noix. He was among the officers who accompanied Lévis to Saint Helen's Island off Montreal for the last French stand in North America before the general capitulation of 1761. Of the war, Bougainville wrote in his journal: "It is an abominable kind of war. The very air we breathe is contagious of insensibility and hardness". Shipped back to Europe along with the other French officers, all deprived of military honours by the victors, Bougainville was prohibited by the terms of surrender from any further active duty against the British. He spent the remaining years of the Seven Years' War (1761 to 1763) as a diplomat, helping to negotiate the Treaty of Paris. Under this France ceded most of New France east of the Mississippi River to the British Empire. After the peace, the French decided to colonise the "Isles Malouines" (Falkland Islands). These islands were at that time almost unknown. At his own expense, Bougainville undertook the task of resettling Acadians who had been deported to France by the British because of their refusal to sign loyalty oaths. On 15 September 1763, Bougainville set out from France with the frigate L'Aigle (Eagle) (captained by Nicolas Pierre Duclos-Guyot) and the sloop Le Sphinz (Sphinx) (captained by François Chenard de la Giraudais). This expedition included the naturalist and writer Antoine-Joseph Pernety (known as Dom Pernety), the priest and chronicler accompanying the expedition, together with the engineer and geographer Lhuillier de la Serre. The expedition arrived in late January 1764 in French Bay (later renamed Berkeley Sound). They landed at Port Louis named after King Louis XV. A formal ceremony of possession of the Islands was held on 5 April 1764, after which Bougainville and Pernety returned to France. Louis XV formally ratified possession on 12 September 1764. Although the French colony did not number more than 150 people, for financial motivations (Bougainville having paid for the expeditions) and diplomatic reasons (Spain feared that the Falklands would become a rear base to attack her Peruvian gold), Bougainville was ordered by the French government to dismantle his colony and sell it to the Spanish. Bougainville received 200,000 francs in Paris and an additional 500,000 francs in Buenos Aires. Spain agreed to maintain the colony in Port Louis, thus preventing Britain from claiming title to the islands. Spain had claimed dominion before the French settlement in association with its colonies on the mainland. On 31 January 1767 at Río de la Plata, Bougainville met Don Felipe Ruiz Puente, commanding the frigate La Esmeralda and La Liebre ("the Hare") and future governor of Islas Malvinas, to transfer possession and evacuate the French population. It was not before 1766, that the English sent a colony to settle in Port de la Croisade, which they had named Port Egmont; and captain Macbride, of the Jason frigate, came to our settlement the same year, in the beginning of December. He pretended that these parts belonged to his Britannic majesty, threatened to land by force, if he should be any longer refused that liberty, visited the governor, and sailed away again the same day. Port St. Louis as established by Bougainville (Dom Pernety, 1769). Port St. Louis (Federico Lacroix, 1841). Port St. Louis (Dom Pernety, 1769). In 1766 Bougainville received from Louis XV permission to circumnavigate the globe. He would become the 14th navigator, and the first Frenchman, to sail around the world. Completion of his mission bolstered the prestige of France following its defeats during the Seven Years' War. This was the first expedition to circumnavigate the globe with professional naturalists and geographers aboard. Bougainville left Nantes on 15 November 1766 with two ships: Boudeuse (captain : Nicolas Pierre Duclos-Guyot) and the Étoile (commanded by François Chenard de la Giraudais). This was a large expedition, with a crew of 214 aboard Boudeuse and 116 aboard Étoile. Included in the party was the botanist Philibert Commerçon (who named the flower Bougainvillea) and his valet. The ship's surgeon later revealed this person as Jeanne Baré, possibly Commerçon's mistress; she would become the first woman known to circumnavigate the globe. Other notable people on this expedition were Count Jean-François de Galaup de la Pérouse (member of the crew); the astronomer Pierre-Antoine Veron; the surgeon of Boudeuse Dr. Louis-Claude Laporte; the surgeon of the Étoile Dr. François Vives; the engineer and cartographer aboard the Étoile Charles Routier de Romainville; and the writer and historian Louis-Antoine Starot de Saint-Germain. He saw islands of the Tuamotu group on the following 22 March, on 2 April saw the peak of Mehetia and visited the island of Otaheite shortly after. He narrowly missed becoming their discoverer; a previous visit and claim had been made by British explorer Samuel Wallis in HMS Dolphin less than a year previously. Bougainville claimed the island for France and named it New Cythera. His expedition left Tahiti and sailed westward to southern Samoa and the New Hebrides, then on sighting Espiritu Santo turned west still looking for the Southern Continent. On 4 June he almost ran into heavy breakers and had to change course to the north and east. He had almost found the Great Barrier Reef. He sailed through what is now known as the Solomon Islands but, because of the hostility of the people there, avoided landing. He named Bougainville Island for himself. 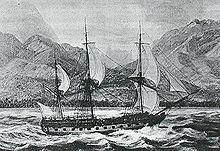 The expedition was attacked by people from New Ireland so the French expedition made for the Moluccas. At Batavia, they received news of Wallis and Carteret who had preceded Bougainville in discovering Tahiti. On 16 March 1769 the expedition completed its circumnavigation and arrived at St Malo. It had lost only seven of its 340 crew, an extremely low level of casualties. This result was considered a credit to the enlightened management of the expedition by Bougainville. Cover page of the English edition of Bougainville's travelogue (1772). In 1771, Bougainville published his travel log from the expedition under the title Le voyage autour du monde, par la frégate La Boudeuse, et la flûte L'Étoile (a.k.a. Voyage autour du monde and A Voyage Around the World). The book describes the geography, biology and anthropology of Argentina (then a Spanish colony), Patagonia, Tahiti and Indonesia (then a Dutch colony). The book was a sensation, especially the description of Tahitian society. Bougainville described it as an earthly paradise where men and women lived in blissful innocence, far from the corruption of civilisation. After an interval of several years, Bougainville again accepted a naval command and saw much active service between 1779 and 1782 during the American Revolutionary War, when France was as an ally of the rebels. He played a crucial part in the French victory at the Battle of the Chesapeake, which led to the eventual defeat of Great Britain. In the memorable engagement of the Battle of the Saintes, in which Admiral George Rodney defeated the Comte de Grasse, Bougainville, who commanded the Auguste, succeeded in rallying eight ships of his own division, and bringing them safely into Saint Eustace. He was promoted to chef d'escadre. When he re-entered the army, he was commissioned as maréchal de camp. After the peace of 1783, Bougainville returned to Paris. He obtained the place of associate of the Academy. He proposed a voyage of discovery to the North Pole but did not gain the support of the French government. In 1787, he became a member of the French Academy of Sciences. He obtained the rank of vice-admiral in 1791. In 1794, having escaped from the Reign of Terror, he retired to his estate in Normandy. Returning to Paris, he was one of the founding members of the Bureau des Longitudes. In 1799, the Consul Napoleon made him a senator. He died in Paris on 31 August 1811. Bougainville's name is given to the largest eastern island of Papua New Guinea; and to the strait which divides it from the island of Choiseul. It is also applied to the strait between Mallicollo and Espiritu Santo islands of the New Hebrides group. In the Falklands, Port Louis, and "Isla Bougainville" (Lively Island's Spanish name) commemorate him. The genus of South American climbing shrubs with colourful bracts, Bougainvillea, is named after him. 1804, he was made a Grand Officier de la Légion d'honneur in 1804. 1808, Napoleon gave him the title of count (the Comte de Bougainville). Thirteen ships of the French Navy have been named in his honour, see French ship Bougainville. Tomb of Louis Antoine de Bougainville, at the Panthéon. Hyacinthe de Bougainville, also a sailor and circumnavigator, was the son of Louis Antoine de Bougainville. Poshumous bust of Bougainville, made in 1831 by Bosio Astyanax Scevola. Portrait of Bougainville at Hôtel de la Marine (Paris). ^ a b c Roberto C. Laver. The Falklands/Malvinas Case: Breaking The Deadlock in the Anglo-Argentine Sovereignty Dispute. pp. 25–26. ISBN 90-411-1534-X. ^ [archive.org] |"Voyage Around The World By Lewis De Bougainville in 1766-9"
^ a b c Salmond, Anne (2010). Aphrodite's Island. Berkeley: University of California Press. pp. 90, 118–119. ISBN 9780520261143. Waggaman, Béatrice Élisabeth, Le Voyage autour du monde de Bougainville: droit et imaginaire. (Nancy: Presses universitaires de Nancy, 1992). Cave, Alfred A., The French and Indian War (New York, Greenwood Press, 2004). Dunmore, John, Storms and Dreams: The Life of Louis de Bougainville (Fairbanks: University of Alaska Press, 2007) ISBN 9781602230019. Wikimedia Commons has media related to Louis Antoine de Bougainville. Wikisource has the text of a 1911 Encyclopædia Britannica article about Louis Antoine de Bougainville.